The Hui sen Th.us’āng System, formerly Pallas, ARK Starmap designation: Th.us’ūng (Pallas) was part of the Perry Line and is best known as the location of first contact between Humans and the Xi’an. This unusual first encounter, which resulted in 276 Humans being taken captive by the Xi’an, is well known, but its aftermath much less understood. The crisis also set the stage for the cold war and sowed the seeds of distrust between the species for centuries to come. In 2530, a greedy Human company attempted to terraform Hui sen Th.us’āng III without doing the proper due diligence. Xi’an were already occupying the system and using it for research purposes. The situation was resolved, but the meeting set the tone for relations between the two species for centuries. Pallas became a part of the Perry Line that reverted to complete Xi’an control following the end of the Messers. "To me, Pallas is the perfect example for how the Xi’an handle Humanity. We’re allowed to visit the system, but they really don’t want us poking around too much. Sort of like that neighbor who’ll answer the door when you knock but never invite you in." In the early 26th century, Humanity was consumed with the prospect of discovery and expansion. Advances in scanning technology made its components much more accessible while innovators worked to refine terraforming processes, both of which led to an explosion of would-be explorers looking for the next undiscovered territory. Humanity’s rapid expansion into numerous new systems created a problem of governance. The United Nations of Earth (UNE) realized that it wasn’t built to govern a multi-system expanse. This realization ultimately led to the formation of a new government to reflect the new landscape of Humanity’s territory: the United Planets of Earth (UPE). A myriad reforms accompanied this name change. A governing tribunal consisting of a High-Secretary, High-General, and High-Advocate was created, plus new rules and regulations were implemented to manage Humanity’s further expansion out to the stars. While many companies recognized and respected these new laws, others ignored them, particularly when lucrative terraforming rights hung in the balance. One such company, Gaia Planet Services, became the most infamous example of the latter. In 2530, a navjumper named Kathryn Segovia discovered the Hui sen Th.us’āng System through Baker and decided to auction off the nav point. She cared nothing for the fame, but craved the fortune. Her preliminary scans indicated the system had mineral-rich locations and one potentially habitable planet, so she lined up bids from those who would pay the most for access — mining and terraforming conglomerates. Gaia Planet Services won the bid and raced a terraforming team into Hui sen Th.us’āng. Comms would later reveal that company executives were eager to cut any corner to offset the exorbitant price paid. Foreman Charles Baxter lead a team into the system and straight to Hui sen Th.us’āng III, where they began surveying the best locations for terraforming equipment. It wasn’t long before strange ships swooped over the horizon and surrounded the survey teams. All 276 Humans were quickly captured and placed under guard. This was Humanity’s first encounter with the Xi’an. Though a language barrier separated the two species, the Xi’an quickly determined that Baxter oversaw the operation. The Xi’an surprised their prisoners by releasing Baxter as a sign of good faith. He fled to the Baker System and immediately contacted his superiors at Gaia Planet Services rather than the authorities. Supposedly, CEO Joseph Jules Jr. argued that they should try and cut a deal with the Xi’an themselves. He was desperate to find a way to spin this debacle into a positive for the company. A handful of sycophantic executives agreed with him, but Baxter and others pushed back. The plan was a pipe dream unless the company had xeno-linguists on staff who could decipher this unknown language. Reluctantly, company executives contacted the UPE and revealed the terrible situation in which they had placed Humanity. The UPE’s best xeno-linguist took 15 days to devise a rudimentary form of communication with the Xi’an, after which official discussions over the release of the remaining workers began. Many within the government grumbled at the terrible negotiating position Gaia Planet Services had left them in, while others fumed at the horrible first impression Humanity had given the Xi’an. The ensuing few weeks were a high-wire act of diplomacy for the UPE. The Xi’an had two primary points of contention that they required to be met before releasing the hostages. The first point was quickly agreed upon; the UPE would vacate the system immediately. It was the Xi’an’s second stipulation that caused great controversy. They insisted that the UPE reveal the extent of their Empire and the location of all currently known systems. UPE negotiators pushed hard not to have that last detail included, but the Xi’an were adamant about it. As political pressure built at home to return the captives to their families, the UPE learned more about these strange new aliens. When it was revealed that they lived for hundreds of standard Earth years, negotiators grew concerned with how long the Xi’an were willing to carry on the negotiation. Many concluded that they had no other choice but to acquiesce to the Xi’an terms. After 57 days, a deal was reached, the ordeal ended, and all hostages were eventually released unharmed, but what Humanity gave up in exchange came to define the relationship between the two species. The disparity between what the Xi’an knew about our systems versus what we knew about theirs was a major source of paranoia for Humanity following the Pallas incident. The actions taken had sown the seeds of distrust on both sides and the two species slowly backed away from the negotiating table, unsure when and where their next encounter would occur. Despite Humanity learning the Xi’an name for the system, Hui sen Th.us’āng, during negotiations, it was not commonly used due to the difficulty many had pronouncing it. The escalating cold war pushed the UEE to give it a different name. 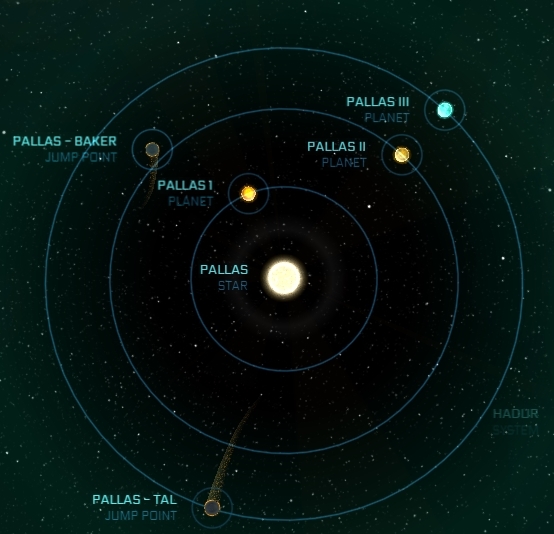 Eventually, the UEE military assigned it the name Pallas to correlate with other Perry Line systems named after gods of war. The name has stuck in the common lexicon. Although the Xi’an ultimately abandoned the system during the height of tension with the Messer regime, the Perry Line Pact ensured that it would remain in Xi’an hands after the Messers were toppled. As is their custom to assign each system a specific purpose, the Xi’an now use Hui sen Th.us’āng as a scientific system to conduct research, much of which remains a mystery to the UEE as Human access to the system is highly regulated. With Hui sen Th.us’āng designated by the Xi’an as a scientific research system, visitors must take care to avoid areas deemed off-limits. Xi’an authorities will not hesitate to interdict or even destroy your ship if it ventures into a prohibited part of the system. Hui sen Th.us’āng is a Main Sequence Dwarf-G star. A terrestrial world that the Xi’An have long used as a testbed for geohacking and terraforming technologies. Several parts of this planet are consumed in smoke, the result of an ongoing massive underground fire. An attempt to terraform this planet by a shady Human terraforming team in 2530 resulted in first contact with the Xi’An.